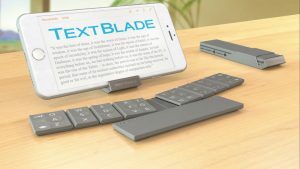 I just pre-ordered a TextBlade keyboard from WayTools. It came across my Twitter feed, and it looks ideal for hooking up to any phone or tablet—letting you type while out in public. I have a desktop at home, not a laptop, and I’ve never had any desire to compose anything on my iPad (nor do I even take it out with me, let alone turn it on often). I also dislike having to carry on conversations on my phone through text messaging. I use a swipe-enabled keyboard, but it’s not the same as the real thing. It seems to me this new keyboard could make mobile communication easier and more manageable.